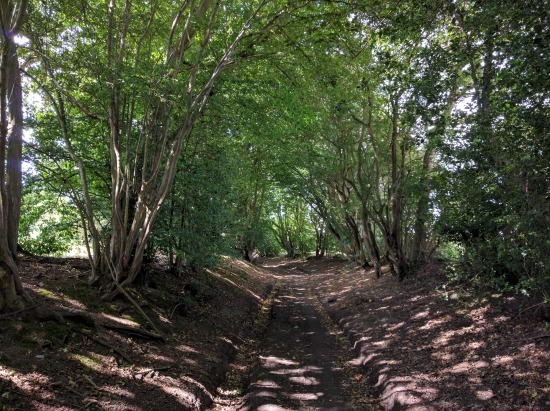 A wonderful four-mile walk along old deep and shaded byways which weave their way through fields and woodland, some of which - according to a local pressure group Save Symondshyde - are threatened by development. This is one of the most attractive walks in our collection, so try it soon in case proposed building plans are given the green light. Park alongside Coleman Green Lane in one of the many lay-bys used by walkers. Head north east along Coleman Green Lane and past the John Bunyan pub on your left, looking out for a byway sign on your right by John Bunyan's Chimney - all that's left of the cottage where he is said to have stayed and preached. Take this byway as it continues north-east, ignoring the first path on the right and looking out for a second path signposted to the right. Take this path. The path you are now on heads south-east uphill with the hedgerow on the right and fields on the left. As with a lot of this walk you can enjoy excellent views across the open Hertfordshire countryside. When you reach the top, you go through a gate and cross fields emerging at a five-point footpath/bridleway/byway crossroad. Care is needed here to ensure you take the right path. Having an Ordnance Survey map will help. You take the path heading almost due south, with the hedge on your right and the field on your left. This path enters woodland and becomes another deep byway. 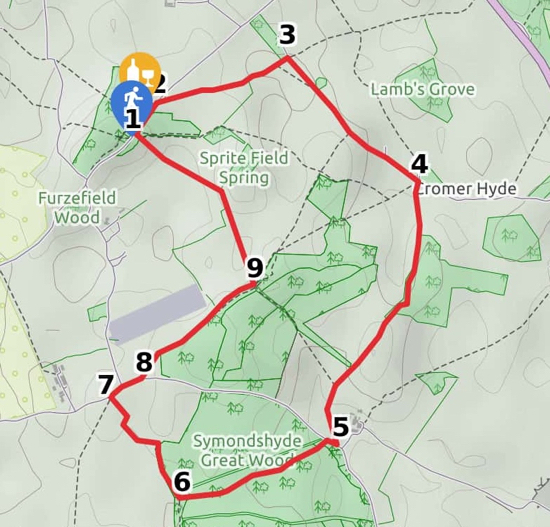 Follow this byway until it reaches Hammond's Lane just past Symondshyde Farm. Turn right and head north west until you emerge on Hammond's Lane again. Turn right and head north-east along Hammond's Lane for a short distance looking out for a footpath sign on your left just before the drive to a house. Take this path and head north-east and continue with the fields on your left until you reach a footpath sign pointing north-west through the crop. Take this path, and continue heading north-west along this path as it cuts through the crops until you reach a gap in the hedge. Go through into the next field keeping the hedge on your left and the field on your right until you reach Coleman Green Lane and your starting point.